My friend Casey is home from New York for the holidays, woo hoo! After picking her up at 2am from the airport, getting zero sleep, and waking up early, we were in need of a deliciously easy and healthy pancake recipe for breakfast. 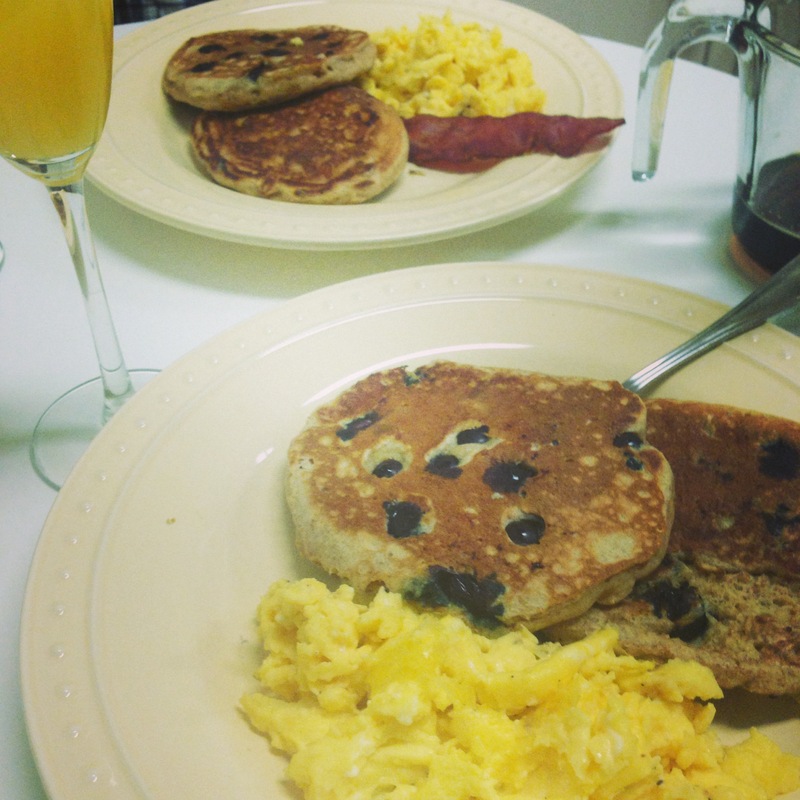 I found this recipe for Oatmeal Buttermilk Blueberry Pancakes and couldn’t wait to try them! Note 1: Make sure you read the recipe all the way through before attempting, especially when running on minimal sleep. Note: this recipe requires mixing ingredients and letting it set for an hour or overnight. Had I know this ahead of time, I would have mixed them up the night before! We skipped this step and made the pancakes without waiting. What can I say, we were hungry! Note 2: Mimosas during the holidays when a friend is visiting is always a good idea when cooking breakfast. It’s even better with fresh squeezed orange juice, yum! Note 3: Fresh blueberries are always better than frozen. However, feel free to use either! Make sure to thaw frozen blueberries before using. Also, note that frozen blueberries will turn the batter blue when you mix them in, so don’t be alarmed! 1. Combine the milk and rolled oats in a bowl, and set aside. 2. Sift together the flours, baking powder, baking soda, sugar and salt. 3. In another bowl, whisk the eggs, then add the buttermilk and whisk together. Then whisk in the vanilla extract and the oil. 4. Add the flour mixture to the wet ingredients and quickly whisk together. Do not overbeat; a few lumps are okay. Fold in the oats and milk. Let sit for one hour, or refrigerate overnight. 5. If necessary, spray the hot griddle with pan spray. Drop by 3 to 4 tablespoons onto the hot griddle. Place six or seven blueberries on each pancake. Cook until bubbles begin to break through, two to three minutes. Turn and cook for about 30 seconds to a minute on the other side, or until nicely browned. Remove from the heat, and continue until all of the batter is used up. 6. Serve hot with maple syrup (and a bit of butter if preferred). We served ours with warm maple syrup, a side of fresh pears, turkey bacon for the meat-eaters, and scrambled eggs. Oh, and mimosas, of course! It was the perfect start to a day of adventuring around San Francisco. Wooo! Blog post! And the pancakes were delish! I’ll definitely try these! Thank you! 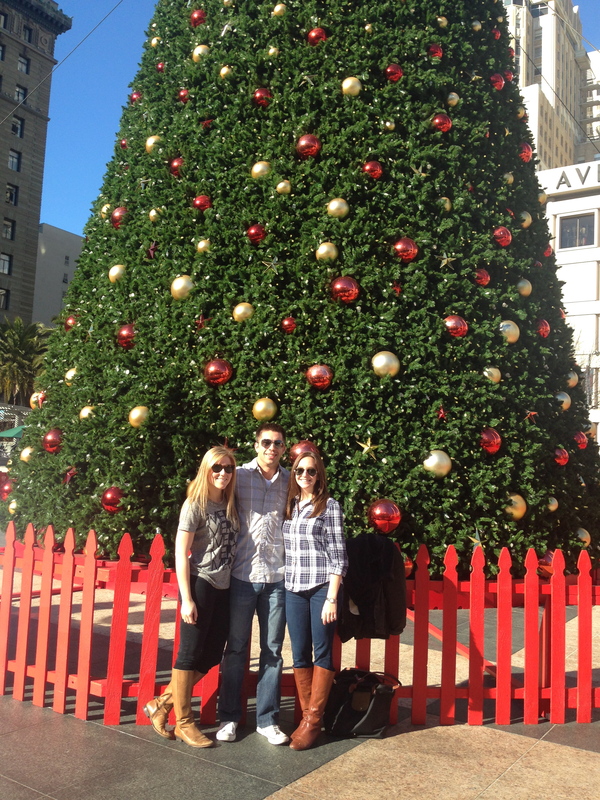 What a great picture with the monuments tree!